Coated parts offer several advantages over uncoated parts. These coatings can facilitate automatic assembly, decrease friction or help with identification. Dry (powder) coatings are most commonly used to treat parts for automatic assembly equipment. The purpose of the powder coating is primarily to reduce the tendency of parts to stick together, forming a clump or mass. To counteract this tendency, All Seals offers dry powder coatings such as talc, powdered PTFE, mica, graphite and molybdenum disulfide. However, over time these coatings may foul assembly equipment and could require downtime for cleaning. Wet coatings are similar to dry coatings in that they are commonly used to increase the efficiency of automatic assembly equipment. However, as opposed to dry coatings, these are aqueous in nature. All Seals’s primary wet coatings are silicone emulsions and soap & water mixtures. These wet coatings generally offer superior lubricity over dry coatings, but can be somewhat messy. Care must be taken to prevent migration across the shop floor. Thin film coatings are essentially sprayed and baked for O-Rings and rubber parts. Typically these coatings are semi-permanent, but can be removed with abrasion. Dry film coatings offer the best lubricity and cleanliness, however the extra processing associated with the coating leads to higher costs. All Seals offers two types of thin film coatings, PTFE and our proprietary HiSlip. PTFE coating has the added benefit of being colorable, which allows for easy visual identification of parts. All Seals also offers our proprietary CC12 surface treatment for NBR rubber. The CC12 surface treatment is a permanent surface modification by which the NBR rubber is halogenated in chlorine solution. The CC12 process makes the surface durometer harder, which permanently reduces the surface coefficient of friction. Dry (powder) coatings are commonly used to inexpensively treat automatic assembly equipment parts. These coatings reduce the tendency of parts to stick together, forming clumps or masses. To counteract this, All Seals offers dry powder coatings such as talc, powdered PTFE, mica, graphite and molybdenum disulfide. Each is similar in function, but can offer different performances depending upon application specifics, such as fluid compatibility or temperature. Over time these coatings may foul assembly equipment, requiring downtime for cleaning, especially with sensitive automatic assembly equipment that utilizes photoelectric sensors. Wet coatings generally offer superior lubricity over dry coatings, but can be messy. Take care to prevent migration across the shop floor. Not to be confused with PTFE powder coatings, PTFE resin coatings are aequeous colloids – acrylic resin binders mixed with PTFE powders and colorants. Heat dries off the water, leaving behind a PTFE/resin film on the part’s surface. These coatings reduce friction and are “semi” permanent as they will not rub off with contact, but can be removed over time. Primarily used for automatic assembly, these coatings offer the best combination of lubricity, cleanliness and cost. Also, high value materials can be different colors for easy identification. There are many types of PTFE resin coatings. Their chemical resistances can be improved by changing their solvent system and resin. For example PTFE may flake off in fuel, however we offer grades with increased fuel vapor resistance. HiSlip is a proprietary All Seals coating process that can be applied only at the time the part is manufactured. This coating offers friction reducing properties approaching PTFE resin coatings, but instead incorporates a silicone resin. The primary advantage of the HiSlip Coating is it tends to have better adhesion properties, and since it is applied in the manufacturing process, it can be slightly less expensive. One drawback is cost, as parylene is applied in a batch process in a reactor chamber. Also, the parylene jacket is not as flexible as an elastomer and can delaminate or lack the same sealability as an untreated part. All Seals’s proprietary CC12 surface treatment is a permanent surface modification in which NBR rubber is halogenated in a chlorinated solution. It makes the outer surface layer durometer harder, which permanently reduces the surface coefficient of friction. To be effective there must be unsaturated carbon to carbon bonds present in the polymer chain. Thus, these treatments are not for such materials as Viton™, EPDM, and silicone. Performance-wise, the lubrication level is not as good as an internally lubricated material or a PTFE coating. However, CC12 offers some cost savings over these coatings and is cleaner than powder/wet film type assembly coatings. Not technically a coating, All Seals can give urethane parts an alternate color if requested. Much like PTFE color capability, the colored urethane can be used to differentiate between similar parts on an assembly line or aid in automatic inspection of parts on machines equipped to look for color variation. 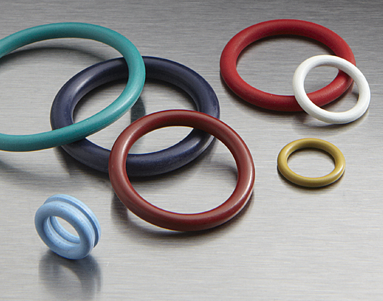 Colored urethane can be custom manufactured, however All Seals’s dying process can be a cost saving step as we dye preexisting, stocked urethane materials. This greatly reduces the cost and lead time over manufacturing custom colored urethane.